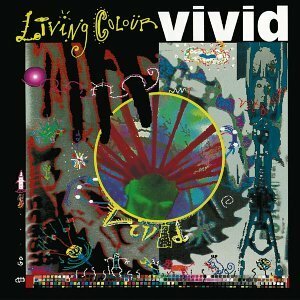 Vivid is Living Colour's debut album, which was released on May 3, 1988. The band was discovered by Mick Jagger while playing a show at punk club CBGB's in 1987. The fact that Living Colour is an all-black heavy metal band drew much attention to the band and the album, which contained three singles and became one of the most popular albums of 1988, reaching #6 on the Billboard 200 and certified double platinum by the RIAA. The band was immediately launched into superstar status and would receive a Grammy for their next studio release. The song "Funny Vibe" features a cameo appearance from Public Enemy's Chuck D and Flavor Flav. Vivid is included in the book 1001 Albums You Must Hear Before You Die. It also contains a cover version of the Talking Heads' "Memories Can't Wait."